The ever-expanding Amazon empire is now offering their own Pay Per Click ads. Amazon Product Ads is an advertising programme designed to provide Amazon.co.uk customers seamless access to products available on external Web sites. As a seller, you simply upload your catalogue of products you wish to advertise and set your cost-per-click bids and budget. Amazon will then display your ads to Amazon.co.uk customers when they shop for your product or related products. Customers who are interested in buying your product can click through to your Web site and purchase the product directly from you. There doesn’t seem to be any restrictions on advertising downloadable software. So it might be worth trying if you software fits into any of the above categories and has a relatively high ticket price (given that typical conversion rates are 1% there is no point paying £0.10 per click for software that you sell for £10). For example, if your software is related to music, you could advertise it alongside musical instruments. I would consider advertising my table planner software alongside books or DVDs related to wedding or event planning. Unfortunately that isn’t an option at present. I could try advertising my software in categories such as Kitchen&Home›wedding favours. But people looking for wedding favours aren’t explicitly searching for table planners, so the click to sale conversion ratio is likely to be well under 1%. Also the minimum bid price in this category is £0.15 and I am guessing that my ads wouldn’t even show if I bid the minimum. 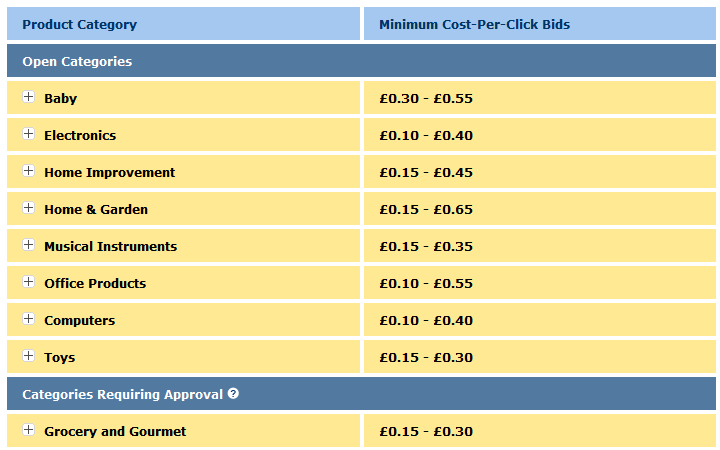 Paying >£0.15 per click with a <1% conversion rate for software priced at £19.95 doesn’t make sense. So I haven’t signed up. It is inevitable that the bid price will inflate over time. So, if you want to try it, now is probably a good time. Amazon.co.uk are also offering £50 in free clicks if you sign up now. You can find out more on the Amazon Product Ads FAQ. 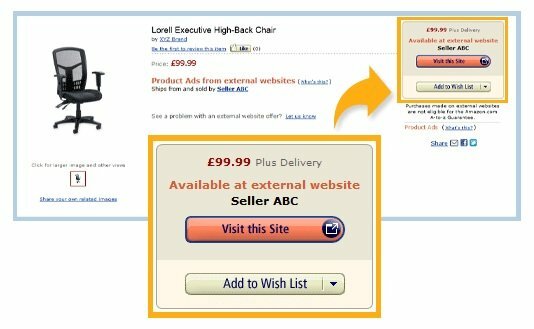 Have you tried Amazon PPC ads? If so, do you have to bid significantly above the minimum bid prices and how do the conversion rates compare with other PPC ads (such as Adwords)? This entry was posted in Amazon, marketing, software and tagged advertising, amazon, marketing, ppc, software on 4 June 2013 by Andy Brice. Your 1% figure might be a bit pessimistic here – the visitors are prequalified by having found Amazon’s page, read what was there, and clicked on something that resembles a “Buy Now” button. I’d expect these visitors to convert better than visitors from search engines (not that I’ll be trying it any time soon – my products are way too niche). It depends on how close your product is to what they are searching for. Also I’m not sure Amazon will wait until they click a ‘buy’ button to show your ad. However I guess people do mostly go to Amazon to buy stuff. >There doesn’t seem to be any restrictions on advertising downloadable software. 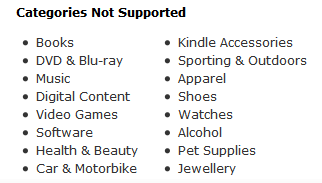 Those are the Amazon product categories you can’t advertise your product in. Rather than the type of product you can’t advertise.